Jim DelGuidice has used his eyes and voice to document the New Jersey scene for more than half his life. His architectural photography for books published by Rutgers University Press twice won him the state’s Historic Preservation Award and his plays have been produced by such venues as the Bickford Theater and Kean University. He is an adjunct assistant professor at County College of Morris and also lectures frequently at Drew and Columbia Universities. He offers workshops and lectures entitled “The Judgson Series” to adult and professional groups in the metropolitan area where topics include American Photography, New Jersey History, a series on Morristown and Morris County as well as The World and Beyond. Jim is a lifelong Morris County resident and is inordinately proud of his one, tiny Wikipedia entry. His keynote topic for our luncheon, “Agents of Change: Famous New Jersey Women” will explore New Jersey women who made a difference. From Dr. Virginia Apgar, inventor of the Apgar score, to legendary Revolutionary War heroine Temperance Wick, the contributions of these New Jersey women are integral to American history. You may be surprised who hailed from the Garden State! Included are socialite Doris Duke, restaurateur Alice Waters, actress Bebe Neuwirth, politician Millicent Fenwick and a ghost named Phebe. We are very excited and pleased to announce that Barbara Whiting, DKG International First Vice-President, will be our guest at the 2018 AZS Convention. Barbara will address the convention on Friday night and again at our General Meeting on Saturday morning. She will also lead a workshop on Saturday afternoon entitled ‘The Story of Possibility.” This is a great opportunity for members to hear and discuss the proposed changes within the society as well as the changes that are already occurring. Barbara looks forward to your input as much as you look forward to hearing from her. Barbara earned her Bachelors degree in Elementary Education from Gustavus Adolphus College, her Masters in Special Education from St. Cloud University and her Specialist in School Administration from the University of Minnesota. Barbara spent 34 years as a classroom teacher, special education teacher and elementary principal. Barbara was a founder of a DKG chapter in Minnesota and served in many capacities, including chapter president. 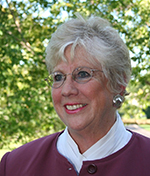 On the DKG International level, she served as a Member-at-Large, as Chair of the Leadership Development and Educators Award Committee, and as a member of the International Membership Committee. She has presented at more than 10 workshops at regional conferences and international conventions. She currently volunteers at a community library, works toward ending homelessness in Hennepin County through Project Homeless Connect and belongs to the World Without Genocide Institute. Barbara is also a member of the Osher Lifelong Learning Institute, where she has served as a an editor, a board member, on the personnel committee and as a course convenor. An avid reader, Barbara belongs to two book clubs and devours between one and three books per week. She loves to travel with her husband Rick and has covered 47 states and five continents. We are honored to have Barbara join us for our 80th birthday convention and look forward to the opportunity to get to know her.